Everyone knows the term the shoe maker’s children go barefoot. When you pour so much of yourself into your job, by the time you get home and have a free minute, the last thing you want to do is feel like you’re working at home. This is how Tom & I often feel. We love what we do but we are pooped at the end of the day. We knew buying our first home meant buying a fixer upper, and we were a little surprised at how long it took us to complete! But we are giving ourselves a bit of grace because what we do every day for a living, sometimes we just don’t wanna do it at home every evening too! But, we are finally done! & my favourite part of our whole space is our wall unit. Although our living room may be small, I’m a firm believer in utilizing the space we have! Usually, putting small furniture in a small space just makes it feel small. So when we put a full sectional and a large wall unit in our space some were skeptical. But I couldn’t be happier with the turnout! 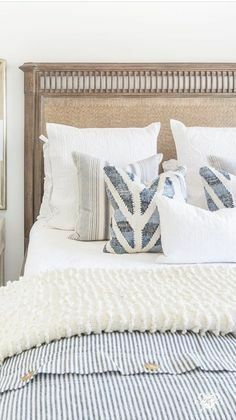 It makes the room feel larger, especially because the best thing you can do in a small room is to use your vertical space. Here is our wall unit in January 🙂 We tore the room right down to the bare bones so we could re-insulate the space and apply fresh drywall. Goodbye yellow paneling. We had just over 9′ of space in this stretch. Therefore, we bought two 24″ wide cabinets and two 30″ wide of the Grimslov style cabinet doors and installed the cabinet boxes in February. Something to keep in mind is that these are cabinets ikea has designed for kitchens, and therefore they are 30″ deep! A typical wall unit is maybe 15-20″ deep. This worked in our space, but it definitely makes it quite bulky. Tom built the upper half of the unit out of MDF board. I can never make things too easy for him, so I next asked him to build us a counter top. 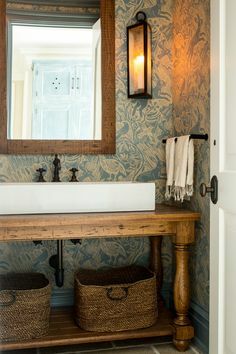 I wanted the upper portion of the unit to step back so it wouldn’t be so deep, plus I wanted to incorporate more pine into the space as we have a pine accent wall in this room as well. In March, we continued to complicate things for ourselves by adding pine backing into the unit, and potlights up top! And finally, in May, the room received it’s first coat of paint followed by crown molding to complete the top of the unit. These base cabinets are 30″ deep, and also 30″ high which is far from standard for a media unit. Keep in mind that your TV will sit a little higher, and the cabinets are very deep! This is exactly what I wanted as our house has really limited storage, and that brings me to the best thing about this unit: storage. My other word of advice is that ikea white is very creamy. I wanted to paint our walls white but the unit was so deeply cream based that whites really clashed with it. 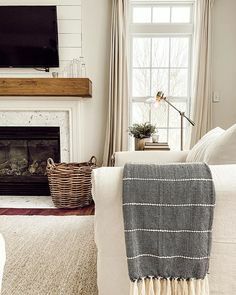 We decided to go with a mid-tone gray to offset that cream colour and add more coziness to the space! And finally, my favourite detail is the pine backing. It added an extra few weeks of reno time onto the project but was well worth it to add a subtle bit of texture and character! I found these acrylic knobs at Lowes and they were buy one get one free at the time – huge steal! You can find them by clicking here. I have to say, I think we did pretty well! All in all, our wall unit cost us approximately $1,000. 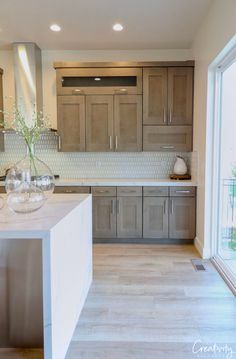 Other than labor being our biggest savings, the ikea boxes and doors were around $750.00 which saved us a ton in comparison to doing custom cabinetry. This price also included all the shelves inside, and the hardware (but I purchased new knobs!). I love what you did with your space! My husband and I bought a fixer upper as well and I am so looking forward to doing this in our living room!